Total Girl bumper issue - extra RNRFairies! The current issue of Total Girl is a bumper issue for Summer 2006, and has 3 pages of the Rock 'N' Roll Fairies (written by Dillon, drawn by me). This one covers a fair bit of ground in terms of story - plenty of both plot and character - and it has some nice visual angles as they explore beneath the thorns (and even get to lowering poor old Monty down on a rope). I'm really happy with how this episode looks in print (these scans don't do it justice). The line densities came out really well and nice and black, and Tamara's colours make it glow, even down in this dark valley. 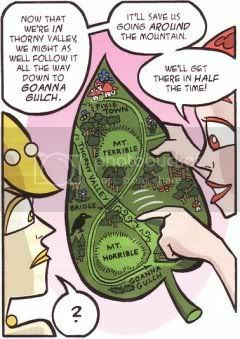 I enjoyed drawing the map a lot, and it gave me a chance to make reference to parts of Dillon's previous Rock 'N' Roll Fairies tale - there's the fence of Penni's place, one of the wild bees and the spider web (where they got guitar strings to restring Autumn's axe). I’ll have to see if I can get this as my daughter loves these magazines anyway…Are you filling in for Dillion or is it a regular gig? They look good though! I’ve got a new method for cleaning up B&W that is easier and more effective than my old method: Scan @ 600dpi greyscale tiff, convert to bitmap (I use 50% threshold) in Photoshop, then back to greyscale (or rgb/cmyk) as needed. Maybe you could just even scan in at 600dpi bitmap then convert? But it’s quick and effective for print. You then have crisp clear simple B&W that you can add tones or colour. Thanks, Anthony, yep, this is a regular gig - I just delivered the latest episode today. The Bumper issue is a good place to start, as it's 3 pages and the major plot is about to take off (which these episodes have been working up to). I tend to scan in 2 bit b&w as TIFFs, then convert to add tones, but in the case of The Rock 'N' Roll Fairies the colours are done by Tamara Wighton, and lettering/finishing by Dillon. Lately, anthologies and magazines tend to ask for artwork at higher resolutions than the old standard of 300dpi - this does make for large file sizes and slows down the whole process (as you've probably discovered).